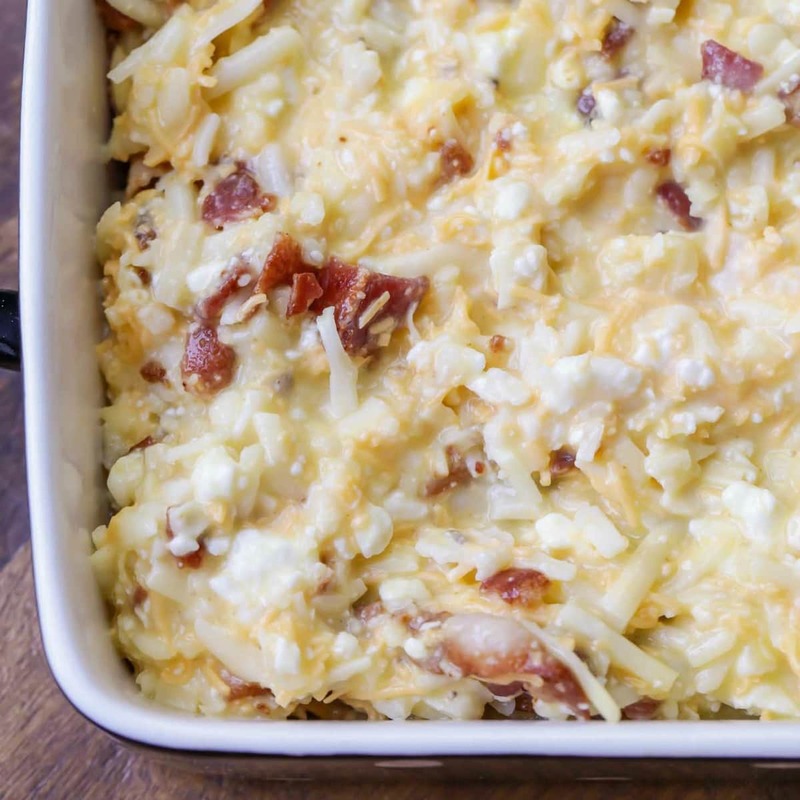 This bacon, egg, and hashbrown casserole is one of our all time favorite savory breakfast dishes. It’s perfect for feeding a crowd, and takes only minutes to whip up. 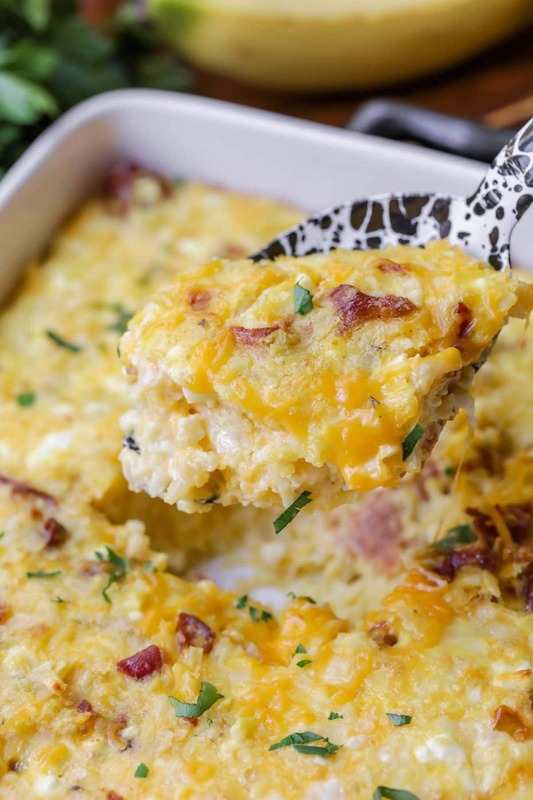 Everyone loves Cheesy Hash Brown Breakfast Casserole! I think I’ve mentioned this a gazillion times before, but I LOVE breakfast recipes – especially savory ones! It’s sad that we don’t have a ton of time in the mornings to make these yummy dishes, but we still try to make them occasionally on weekends, and definitely for special occasions and holidays. 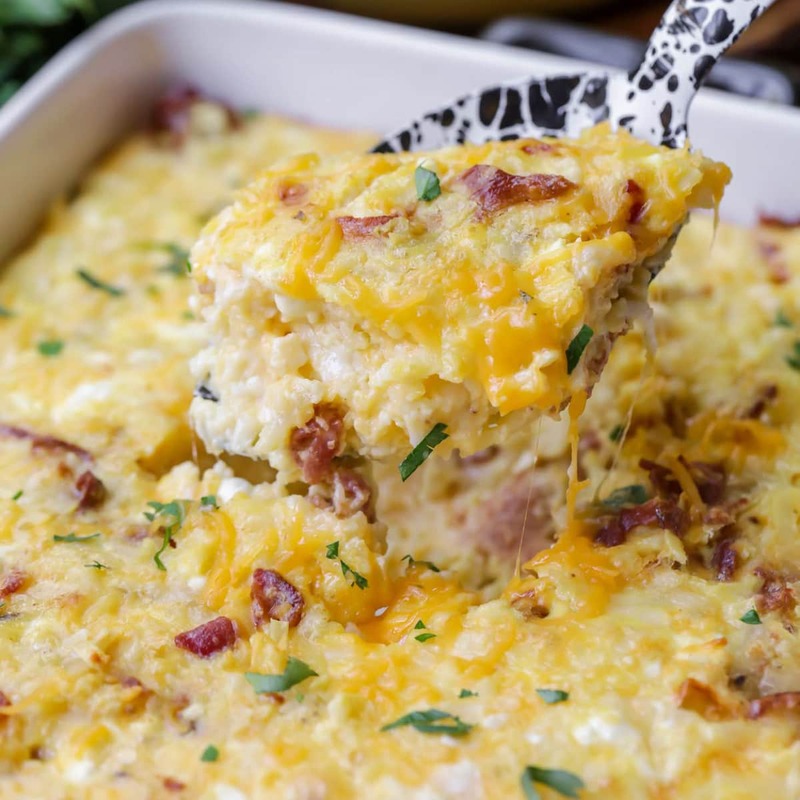 Over the years, we have tried a TON of new breakfast casseroles, like our Biscuit Egg Casserole and Sausage Breakfast Casserole, but we wanted to try a breakfast casserole with hashbrowns! 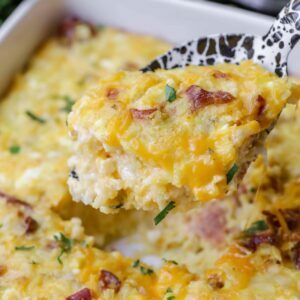 This Hash Brown Egg Casserole includes all the best breakfast items – hash browns, eggs, and bacon. Using those items, you will just need a few minutes to make this breakfast casserole. 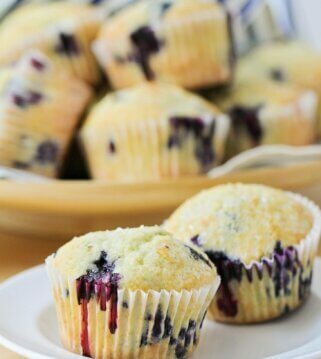 Mix them together with 3 different cheeses, bake to perfection, and you have an amazing breakfast dish to enjoy. You can see all three cheeses mixed in! This recipe is pretty adaptable for any dietary needs or eating preferences your family members might have. If you can’t stand the cottage cheese, you can try swapping it out for ricotta cheese (a little drier and higher in fat content), greek or unsweetened yogurt, sour cream (more tart), or mayonnaise. For a meatless version, you can omit the meat altogether and maybe add some cooked mushrooms and bell peppers instead. Meat lover? Add cubed ham or cooked sausage along with your bacon. Or you can opt to use either of those instead of bacon. Add chopped green onions for some extra flavor. 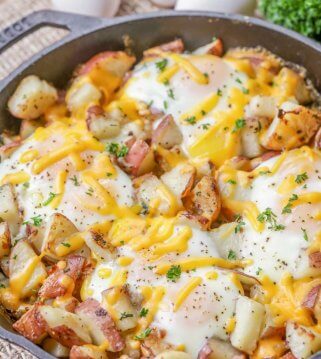 This bake/casserole is probably in my list of top 10 breakfast recipes. It’s perfect because it feed a crowd, it’s ultra simple to throw together, and it’s actually really inexpensive! Another bonus is that it also reheats well. We made it and had leftovers and enjoyed it for the next few days because it was still so good! Can hashbrown breakfast casserole be made overnight? 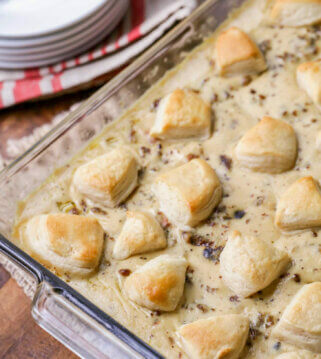 This recipe actually works great as an overnight casserole! Throw it together like normal, cover, and refrigerate overnight. Then add an extra 10 minutes or so to the baking time in the morning. Be aware, however, that the heavier ingredients might settle to the bottom. You can give it a quick stir in the morning to avoid this, but it makes a great overnight breakfast casserole with hash browns. Can you freeze this breakfast casserole with hash browns? Absolutely! You can freeze it before or after it has baked and cooled. Just cover the dish tightly with plastic wrap and foil, and store in the freezer for up to 3 months. When you’re ready to cook it, let it thaw in the fridge overnight and then bake like usual. If it’s already baked, thaw, and then cook for about 30 minutes at 350° or until the middle is no longer cold. 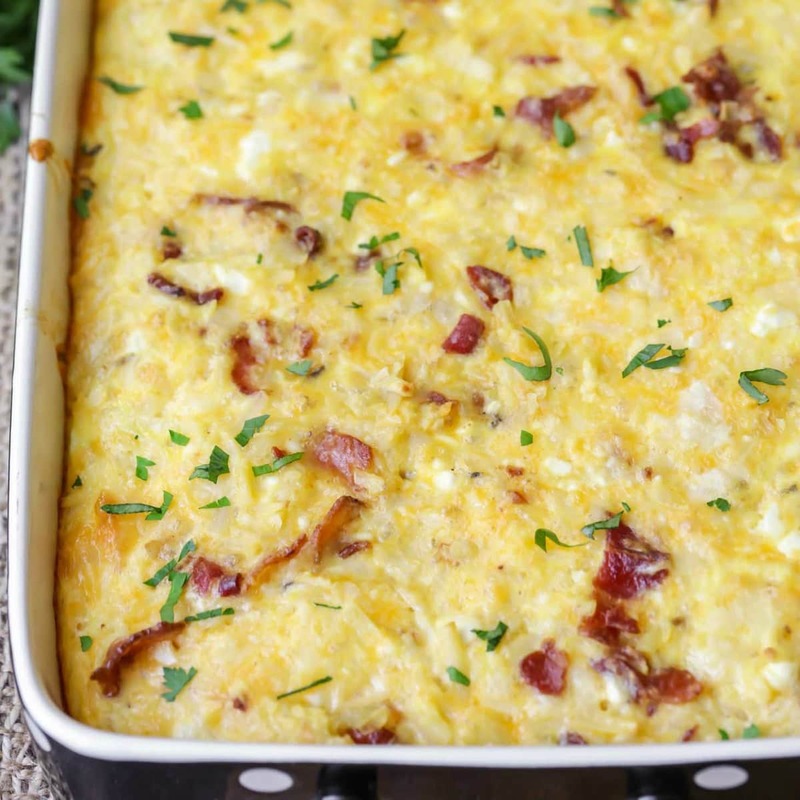 This bacon, egg, and hashbrown casserole is one of our all time favorite savory breakfast dishes. It's perfect for feeding a crowd, and takes only minutes to whip up. Preheat oven to 350 degrees, and grease a 9x13-inch baking dish. Cook diced bacon in a skillet until browned and put into large bowl. Stir in potatoes, eggs, cheeses and salt & pepper. Pour mixture into greased baking dish. Bake for 40-45 minutes. Let stand for 10 minutes before serving. ENJOY! I’m so glad 🙂 Thank you for stopping by! 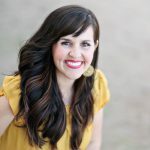 Hi Kristyn, I’m so excited to make this recipe for my friendsgiving brunch. Can you please tell me what the green garnish is on top of the hash brown casserole. Is there anything I could sub for the Cottage cheese? I think this would be awesome as part of Christmas morning breakfast but my husband won’t touch it with cottage cheese. You could do sour cream or yogurt? I haven’t tried, but usually those are great substitutes for cottage cheese. It doesn’t totally melt, but you can use yogurt, sour cream, mayo, or ricotta cheese if you prefer. I love that i can make This ahead of time and have a fiLling meal on a busy morning. I love how easy & tasty this casserole is!! My hubby loves breakfast, so I made this and also added sausage & it was a hit!! He has requested it again! 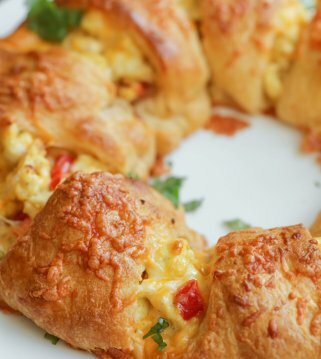 THis looks so easy and perfect for when I have lots of people over for breakfast! This casserole looks so good and hearty. One of my friends makes something similar but I never knew how to do it, now I do. Thank you! Yes, you do & I hope you try it soon! I’d love to know what you think! We love this recipe so mUch! My kids can never get enough! This will be perfect for our new years brunch! I hope you give it a try! Have fun! What a perfect breakfast idea. A must try for sure. Love breakfast Casseroles! Thanks for the delicious recipe! This is one of our favorite breakfast casseroles! We love it so much we sometimes have it for dinner too! We love breakfast for dinner 🙂 I am glad you like it! Thank you for letting me know! This makes the perfect breakfast dish! My family loves it! 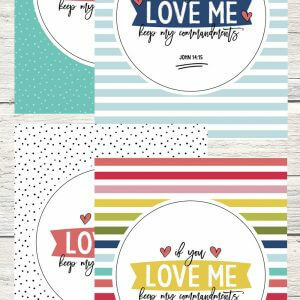 Im such a fan of make ahead dishes. Its no wonder I gravitate to these Type of recipes. I like the combination of our favoRite breakfAst foods all in one. Can this recipe be halved? If so, how long would it need to be cooked? Yes, it can be halved 🙂 Maybe, check it at 25 minutes, then add more time from there. For those who had an issue with cottage CHEESE, try using 4% fat and SMALL CURD cottage cheese. Then you could pulse it even smoother in a blender or with beaters in a small mixing bowl. Diced breakfast sausage links are also good to sub in for bacon.